The 5th Edition of the globally acclaimed, International Infrastructure Management Manual (IIMM) has been driven largely by the introduction of the new ISO 55000 Asset Management Standards. Recognising that the ISO Standards are very much the “What to do”, the IIMM provides the “How to do it” in terms of applying the standards for infrastructure asset management. Over 30% of the previous edition has been update including numerous new case studies. The new IIMM also includes a review and update of the glossary of definitions to ensure better alignment with those in ISO 55000 and an index to assist with locating subject-relevant material. has played an extremely critical international role in promoting these improvements. that continuing improvement. Sincere congratulations to all concerned! Sustainable Infrastructure Asset Management has improved significantly during my working life, and for 15 years IIMM has played an extremely critical international role in promoting these improvements. This new edition with its strong links to ISO 55000, its updated material and additional case studies will further assist that continuing improvement. Sincere congratulations to all concerned! Infrastructure AM has advanced significantly over the past 25 years and I’ve seen the various editions of the IIMM support that advancement. I congratulate IPWEA on maintaining this progress through Version 5 with its strong links to ISO 55000, updated material and new case studies. 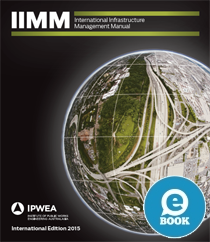 The IIMM is a valuable resource for all asset management practitioners. Well done IPWEA!